I'll admit it. I'm a bit of a coffee snob. When I first started drinking coffee in college, low cost and high caffeine buzz was my primary concern. Of course, those were the days right before Starbucks became a brand that everyone recognized. 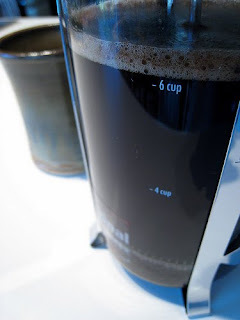 Once a coffee drinker steps over the line from brewing Maxwell House in the coffee pot at home to a high quality, freshly ground cup o' joe, though, it's really hard to return to the cheap stuff. Do I drink crappy coffee on occasion? Sometimes, if I need to, but over the years as I have tried various types of coffee, I am drawn to the best and repulsed by the mediocre, even if it costs me a little more. If I have a choice in the matter, I will chose the better tasting coffee. Over the last several months, I have been honestly dumfounded by the choices of a certain individual in my life. God has a much better plan for this person, but right now, they just can't see it for whatever reason. Their spiritual eyes have been blinded to the truth of God's Word. Their heart has become as hard as a diamond. It's as if they have been drinking Starbucks coffee for years, became unsatisfied, and then went back to Maxwell House because they suddenly thought the medicore brand was a better choice. For the seasoned coffee drinker, a choice like this makes entirely no sense whatsoever. As a believer in Christ, I don't understand the bad choices this person continues to make. You know, the nation of Israel acted like this as well. The fledging Jewish nation had been multiplying in Egypt since the day Jacob moved his family there during the great famine in order to be with Joseph. Over the span of 430 years, Jacob's family grew from 70 people to millions, and after Joseph died, the Israelites were made slaves by their Egyptian hosts. The enslavement of the Israelites was a harsh one. Exodus 1:11a, 14 explains the difficulty that they endured: So they put slave masters over them to oppress them with forced labor... They [the Egyptians] made their lives bitter with hard labor in brick and mortar and with all kinds of work in the fields; in all their hard labor the Egyptians used them ruthlessly. The Israelites cry out to God for help, and He sends them Moses and Aaron. As a result of the 10 plagues, Pharaoh finally relents and releases the Israelites. Then, after God's amazing miracle of parting the Red Sea and rescuing them from Pharaoh's army, the Israelites find themselves two months later complaining about being stuck out in the desert. They started wishing they were back in Egypt, the land of their captivity! In the desert the whole community grumbled against Moses and Aaron. The Israelites said to them, "If only we had died by the Lord's hand in Egypt! There we sat around pots of meat and ate all the food we wanted, but you have brought us out into this desert to starve this entire assembly to death" (Exodus 16:2-3). In two short months, the Israelites totally forgot about the brick-making, the whips, the beatings, the long days in the hot sun, and so on. They couldn't look ahead to the land that had been promised to them. A much better place where God had promised to bless them if they would just walk in faith and obedience. To be completely honest, I don't know that there is a solution to helping people make better choices. Some people are so strong-willed and stubborn that they need to live in "Egypt" for a while before they finally wake up to God's best for their lives. It's sad that some people are this hard-headed, but it's reality. If someone in your life is making poor choices, all you can do is pray for them to start making better choices and be available to them if they need help. Personal and corporate worship. It's going to be more difficult to make bad choices if you are pursuing a growing relationship with the Lord. You need to be in the Word and prayer daily if you are going to have the mind of Christ in your decision-making process. You also need to be involved in a local, Bible-believing church, surrounding yourself with believers who are on the journey with you. Accountability. You need to find somebody (or form a small group) in whom you can be completely honest with regarding life choices. When you start even thinking about making poor choices, this person (or people) will love you enough to kick your tail in order to help you make better life choices. Obviously, these people need to be strong in their faith. People struggling with their own bad choices may influence you to take the wrong direction. Professional counseling. There is no shame in seeking out a professional Christian therapist to help you in making better choices. These people have been trained to help people who consistently make bad choices. The key here, though, is that you have to DESIRE to make changes in your decision-making process. Without the desire to change, change cannot take place. BLESSED (HAPPY, fortunate, prosperous, and enviable) is the man who walks and lives not in the counsel of the ungodly [following their advice, their plans and purposes], nor stands [submissive and inactive] in the path where sinners walk, nor sits down [to relax and rest] where the scornful [and the mockers] gather. But his delight and desire are in the law of the Lord, and on His law (the precepts, the instructions, the teachings of God) he habitually meditates (ponders and studies) by day and by night. So how about you? Do you need to make some changes in your life to guard against making poor choices? What do you need to do today to start making some better choices? If you struggle in this area, what is the one activity that has helped you the most?